MOSCOW, April 25. /TASS/. Russian cosmonauts working aboard the International Space Station (ISS) have replaced a water-heating unit with the expired service life, in which yellow admixtures caused by limescale crust were earlier found, the press office of Russia’s Energia Rocket and Space Corporation told TASS on Wednesday. "Today the cosmonauts have replaced the water-heating unit in the Russian segment of the ISS where yellow admixtures were found by a reserve heater that was available aboard the station," the corporation said. Some media outlets reported on Tuesday that problems had emerged with the quality of hot water and yellowish admixtures of unknown origin had been discovered in the space station’s Russian segment. Reports stated that the cosmonauts allegedly had to use water in the US segment. 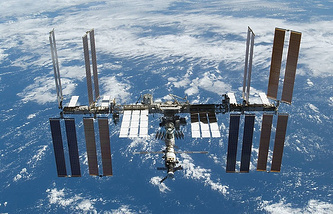 Energia First Deputy CEO for Space Systems’ Flight Operation and Tests Vladimir Solovyov told TASS on Tuesday that limescale crust inside a ‘samovar’ whose service life had expired was the cause for the appearance of yellow water admixtures in the Russian segment of the International Space Station. "A household cause is behind the emergence of the yellow admixtures in the water. Routine limescale crust had formed in the water-heating unit, which had reached the end of its service life. There is nothing terrible in that as we are regularly confronted with such things on Earth. The problem is solved quite easily, we will just promptly replace this unit, which cosmonauts normally call ‘samovar,’ with a reserve one," Solovyov explained.